One of Brixton’s landmark buildings, the renovated Department Store dominates the junction between Ferndale Road and Stockwell Avenue close to Brixton station. Amongst other boutique outlets, it’s home to Canova Hall, offering Italian street food as an alternative to the already vibrant Brixton culinary scene. The lavish 19th century exterior originally housed a workhouse and canteen. The architects behind the renovation project have created a space which echoes the buildings heritage, by maintaining the atmosphere of a canteen. The art deco bar stands as the centrepiece of the hall, decorated with ornate lampshades and Edwardian bar fittings. This is juxtaposed by the exposed ceilings and plastered walls. Wood panelled benches line the glass wall, for guests seeking privacy, with picnic-style benches at the back for the more casual diner. 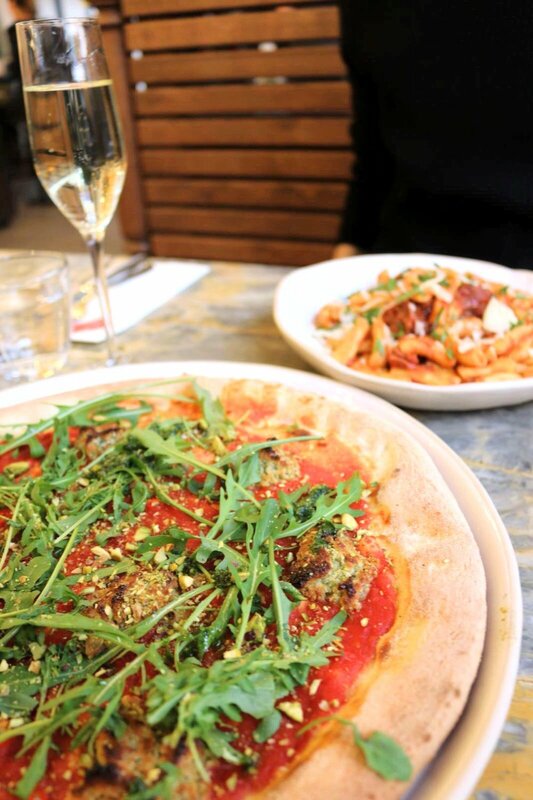 The brunch menu is in keeping with the canteen vibe, with an array of Italian/American street food delights including Pizzas, Pasta and Fried Chicken. There’s a great selection to cure any hangover! The evening menu features Italian style tapas dishes such as Beetroot Gnocchi and Fried Aubergine, perfect for casual dining for those who appreciate eating out. The option of bottomless brunch was too tempting to resist and we started with a Martello Rum Punch and Frizzante. The Frizzante was a refreshing change from Prosecco, less carbonated with a dry aftertaste; the Punch was sweet but not too much to mask the exotic rum flavour. The extensive pizza menu caters for all tastes, whether you prefer tomato or béchamel base or meat or Vegan toppings. Intrigued by the sound of Cashew Nut Cheese and Pistachio Pesto, I opted for the Vegan Pizza as the antithesis to my guest’s comforting Beef Rigatoni. The Pizza was crispy and light with a rich tomato base and the cashew nut cheese was sweet and surprisingly creamy. The Rigatoni was equally delicious, with authentic, homemade pasta which was soft and covered in a glossy tomato sauce enriched with melt-in-the-mouth beef. Continuing the Italian/American theme, the bambolini, Italian doughnuts, were the obvious choice for dessert. The doughnuts came accompanied with equally delicious jam and Nutella dips, rather than the more conventional ice-cream alternative. With a rustic, sugary coating and a greasy centre, the bambolinis provided an extremely indulgent finale when paired with both dips. Canova Hall is a great new find, providing a vibrant and open space perfect for both intimate and group dining. We left with a sweet taste in our mouths, not just from the bambolini, and a desire to return.